Home / Unlabelled / ADIEU ELY GOLD: Chief Raphael Obidimma, Odumodu Aguleri Buries Mum. ADIEU ELY GOLD: Chief Raphael Obidimma, Odumodu Aguleri Buries Mum. The entire family of Obidimma in Enugwu Aguleri, Anambra East Local Government on Friday Nkwo 17th of August bid farewell to their late , mother Ezinne Mrs Elizabeth Ezeliagbo Obidimma Nee Chioba, alias Ely Gold, whom gave up the ghost on Sunday 29th February 2018 after a brief illness. LITTLE BIOGRAPHY OF MAMA ELY GOLD. Ezinne Mrs Elizabeth Ezeliagbo Obidimma was born on February 18, 1940 to the family of late Augustine and Anna Chioba. She was the third and first daughter of the family. In line with the Catholic Church, She was baptized on 22/02/1940 by the foremost Catholic missionary priest in Aguleri, the late Rev Fr Joseph Delaney. Being the first female grandchild of the great Kwazu family ofEnugwu Aguleri, Mrs Elizabeth Ezeliagbo Obidimma had the pleasure of being brought up under two caring homes. She shuttled between her parents and enjoyed the best of both. Mrs Ely Goldas she was fondly called, had her primary School education at St. Raphael's Primary School, Amaeze Aguleri where she studied up to Primary Two. Thereafter, she went to engage on vocational profession and was an apprentice to her aunt, Late Mrs Theresa Ejoh (Nee Kwazu) to learn sewing and domestic science. All Agulerians as at that time knows Mrs Ejoh was tough and thoroughly a disciplinarian that you just don't have option than to fall in line or face punishment squarely without pampering. This paid off as the young apprentice learned her trade perfectly. She was already an accomplished seamstress and her own apprentices before she got married to her loving husband Chief Chudeli Michael Obidimma in the year 1961. Ezinne Mrs Elizabeth Ezeliagbo Obidimma lived and died a fulfilled woman. At the family level she was the peace maker and also doubled as mother hen. Gathering and providing food for her children and numerous cousins, nephews, nieces and neighbours. Chief Raphael Obidimma ODUMODU AGULERI described her mother as a truly loving, devoted, committed and caring mother. He said he learnt a lot of from her late mum, that even at times when he feel confidence and good from his father that her late mum was the one who taught him that he can stick out his neck in trying times and proclaim that as long as he did not plan evil against anyone that no evil shall find abode in his life. He further says that her mother took her responsibilities so seriously to each and everyone of her children even as they are quite a number alongside several relatives that grew with them. He said it was through her late mum that he learnt practising love to fellow men and preaching about love as the ultimate law of God and that it's the centre and the driving force of all relationship. She is also survived by a host of grand children, Cousins, Nephews and Nieces. 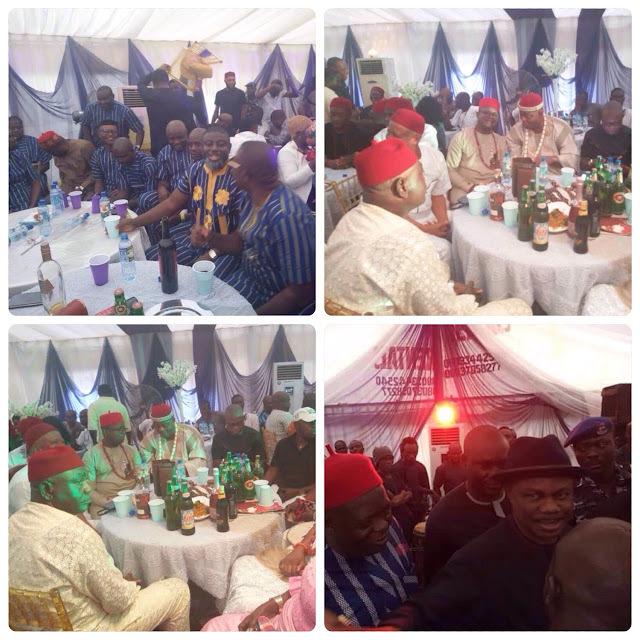 The funeral ceremony turned out to be a great event that attracted the presence of who is who in Anambra/Nigeria, and politicians irrespective of party affiliations and business moguls. Leading the powerful dignitaries that graced the occasion was the number one citizen of Anambra State, the indefatigable Governor of our dear state, His Excellency Chief Dr Willie Obiano , Akpokuodike Global and host of top government officials. At the arena we witnessed the presence of almost all the political aspirants in Omabala region. and others numerous to mention. 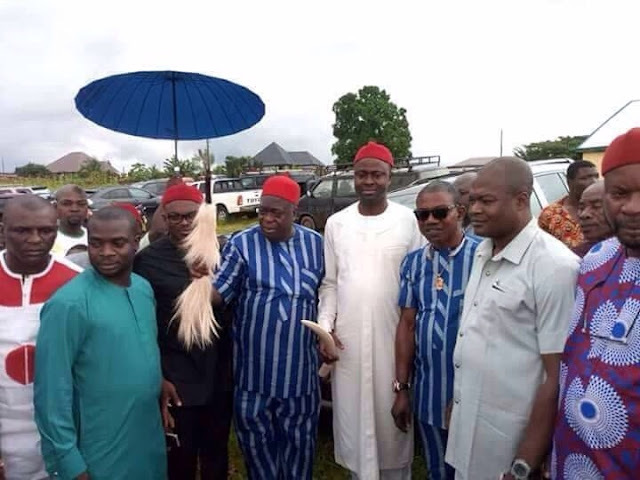 The members of Omabala Parliaments was as well very much on ground to commiserate with Chief Ralph Obidimma whom is also their member. Ezinne Mrs Elizabeth Ezeliagbo Obidimma will be missed by a lot people who related with her on earthly sojourn.